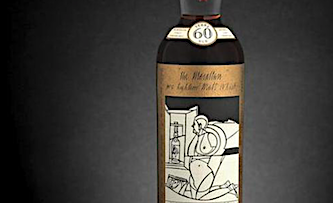 A bottle of the extremely rare The Macallan Valerio Adami 1926 60 year old sold at Bonhams Whisky Sale in Edinburgh for a new world record of £848,750. It had been estimated at £700,000-900,000. The previous world record was set by Bonhams in May this year when another bottle of The Macallan Valerio Adami 1926 was sold for £814,081. Bonhams Whisky specialist in Edinburgh Martin Green said: ” I am delighted at this exceptional result. “It is a great honor to have established a new world record, and particularly exciting to have done so here in Scotland, the home of whisky. The whisky was bottled in 1986. Valerio Adami (born 1935) is an Italian artist famous for painting bold, flat forms outlined in thick, black lines, in a style reminiscent of comic art.